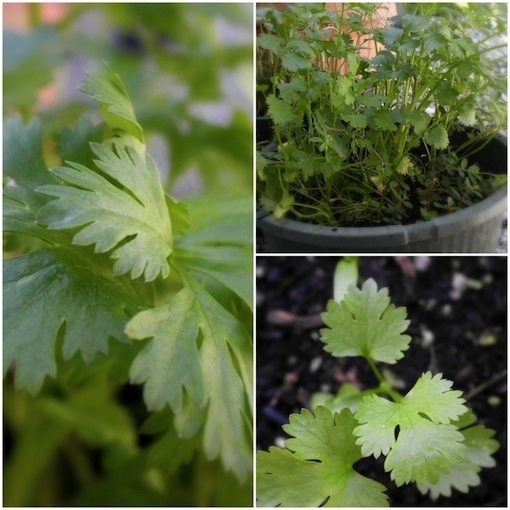 Cilantro is one of those herbs that adds a fresh flavour to many meats, salads and, of course, Mexican-style dishes. It also however, seems to be one of those items that is always forgotten to be purchased from the market or store. Luckily - if planted correctly, cilantro can produce 'never-ending' harvests (4 full harvests from one plant). To start, find a bowl at least 15 inches in diameter and 8-10 inches deep. Fill the pot with soil and organic fertilizer - make sure the plant has an adequate way to drain. Moisten the soil using a fine spray, and add the seeds, careful to spread them out evenly. If you wish you can mix three parts sand to one part seed so they will disperse more evenly. Cover the seeds with a light layer of soil, and spray the top layer as to not disperse the seeds. By placing the seeds in full sun/light shade, you can expect germination in 7-10 days. When ready, harvest at least once a week to keep new leaves growing. By doing this you can expect at least four large harvests of fresh, organic cilantro from a single pot.